The first file you need to create is the bootstrap file. This file acts as the entry-point and configuration for your application. In this file, you can implement initialization of components as well as application behavior. In the next part, we register the “view” service indicating the directory where the framework will find the views files. As the views do not correspond to classes, they cannot be charged with an autoloader. Next, we register a base URI so that all URIs generated by Phalcon match the application’s base path of “/”. This will become important later on in this tutorial when we use the class Phalcon\Tag to generate a hyperlink. 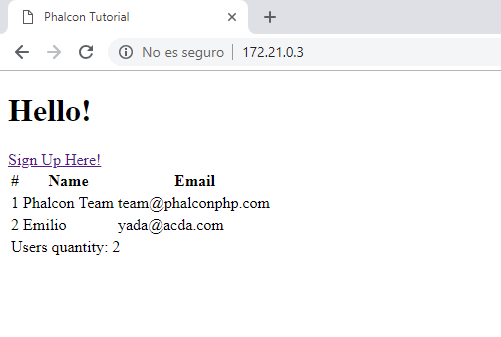 In the last part of this file, we find Phalcon\Mvc\Application. Its purpose is to initialize the request environment, route the incoming request, and then dispatch any discovered actions; it aggregates any responses and returns them when the process is complete. 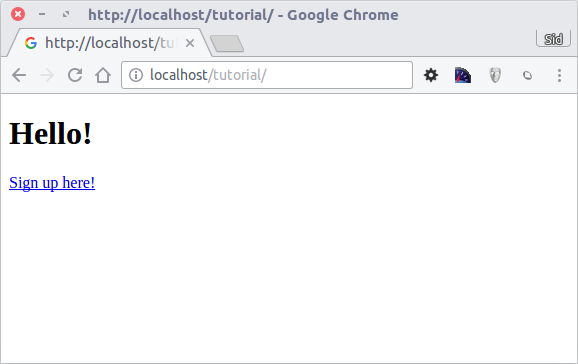 The browser output should remain the same. 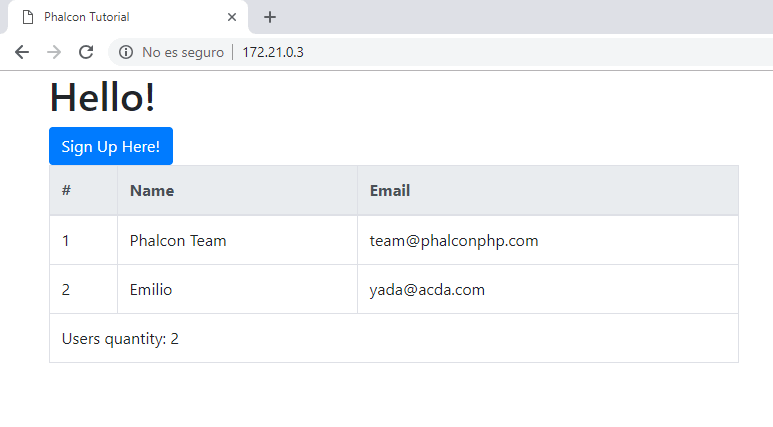 The Phalcon\Mvc\View static component is automatically created when the action execution has ended. Learn more about views usage here. To generate the tag we use the class Phalcon\Tag. This is a utility class that allows us to build HTML tags with framework conventions in mind. As this class is also a service registered in the DI we use $this->tag to access it. 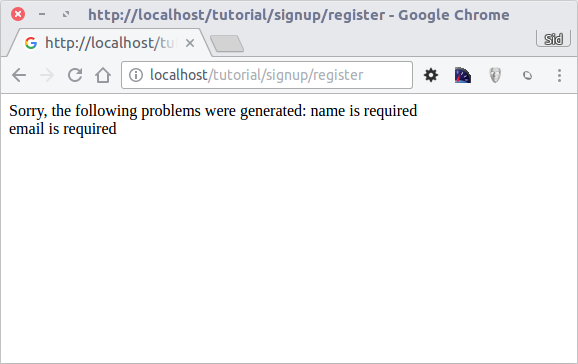 Exception: Action "register" was not found on handler "signup"
If you click the “Send” button again, you will see a blank page. The name and email input provided by the user should be stored in a database. According to MVC guidelines, database interactions must be done through models so as to ensure clean object-oriented code. With the correct database parameters, our models are ready to work and interact with the rest of the application. 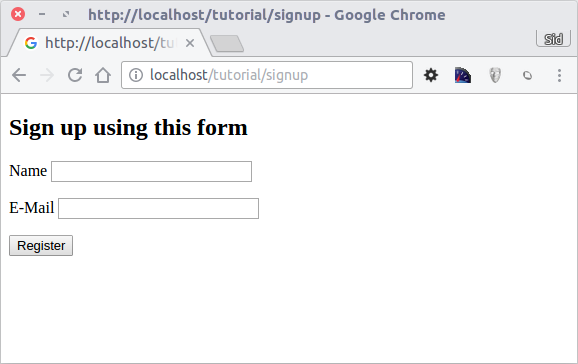 At the beginning of the registerAction we create an empty user object from the Users class, which manages a User’s record. The class’s public properties map to the fields of the users table in our database. Setting the relevant values in the new record and calling save() will store the data in the database for that record. The save() method returns a boolean value which indicates whether the storing of the data was successful or not. The ORM automatically escapes the input preventing SQL injections so we only need to pass the request to the save() method.